Apart from the Golden Circle, that gives you an ideal opportunity to discover beautiful places not far away from Reykjavik, West Iceland is the only way to enjoy stunning waterfalls, ancient caves, natural geothermal hot springs within just an hour from the capital. We picked up the five sights that best represent West Iceland. This geothermal hot spring is the biggest and the most powerful in Europe. Its water is used for central heating in such towns as Borgarnes and Akranes. There is a footpath from the parking lot to Deildartunguhver, but bear in mind, that the water from the hot spring is sometimes splash over, so it is better not to come too close to this bubbling boiling water. It is located just 50 km from Reykjavik, and gives a chance to enjoy stunning features of West Iceland with its shores, canyons and waterfalls. Probably one of the most outstanding sights here is Glymur waterfall, which is the second highest waterfall in Iceland. It is certainly the most famous cave in the country. Surtsgellir is located in the Hallmundarhraun lava field. The most remarkable part of the cave is where ice candles and columns can be found. Surtshellir is named after fire giant Surts, who was one of the most famous characters in Norse mythology. The name of this beautiful waterfall is translated as “Lava waterfalls” and basically that how it can be described. Hraunfossar consists of several waterfalls that are streaming out of the lava field. 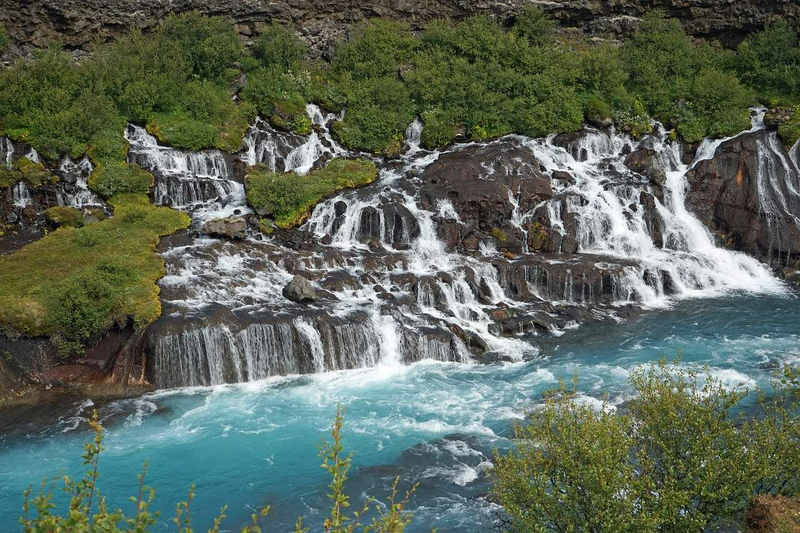 Just a few steps from Hraunfossar, you will find another waterfall - Barnafoss, it is translated as “Children’s fall”. Apart from stunning views, Barnafoss is also part of a dark mythology in Iceland. According to this legend, the name of the waterfall comes from the story of two boys, who fall into the water and drowned. Their parents went to a church for Christmas service, the boys were supposed to stay at home, but they decided to go to the church as well. To cut the road, they walked on a natural bridge above the waterfall, but felt dizzy and fall down. When their mother found out what had happened to her children, she made a spell that nobody would ever use the bridge again and soon it was destroyed during the earthquake.